Sometimes it’s hard to get the full beauty of a viewpoint amongst all the clutter of the day, especially on our crowded collection of islands. In history, when buildings were few and far between and we hadn’t yet divided the country up into interstitial parcels of land between roads - as is the psychological outcome of the motoring atlas - the views over the landscape we had must have felt very different. As mentioned in The Lie of the Land, our ancestors had a very different relationship with views from high ground - upland (even a range of hills as modest as the Cotswolds) had a terror all of its own and a view over a wide vale like the Severn would have come as a welcome relief. What buildings there were nestling in the valleys would have had greater significance - especially after a long journey or pilgrimage across the country. I hope that this view of Salisbury Cathedral - which for hundreds of years would have been the tallest building in the western world - captures something of the awe a long-distance medieval traveller would have felt 700 years or so ago. 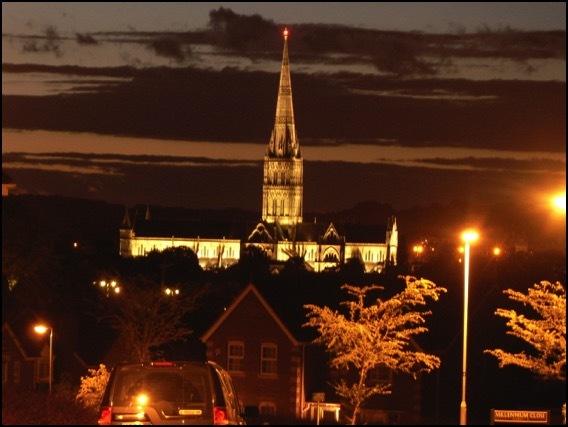 By removing the detail of the town that has grown up around it, with its ring road, modern development and other 20th and 21st Century clutter and even with the housing development in the foreground, this magnificent old cathedral still takes your breath away.